Armenta bracelet from the Sueño Collection. 18-karat yellow gold dragon caps. Bezel-set diamonds and white sapphire details. Split cuff for slip-on style. Alex and Ani cuff with moon and star ends. Sterling silver with 14-karat gold plating. Split opening for slip-on style. Crystal cuff bracelet earrings by Alexis Bittar. Golden and rhodium-tone-plated hardware. Mixed Swarovski?? crystals and pyrite. Split opening eases dress. Crystal cuff bracelet earrings by Alexis Bittar. Golden and rhodium-tone-plated hardware. Mixed Swarovski?? crystals and pyrite. Split opening eases dress. Approx. 2.5"W; 2"H. Imported. 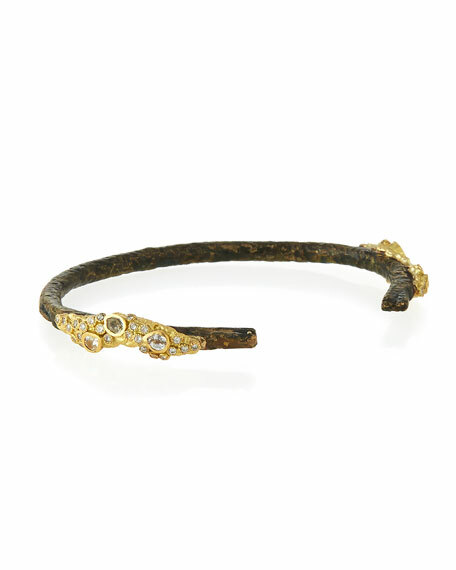 Alexis Bittar crystal encrusted freeform Roxbury cuff. Silvertone and 10-karat gold plated brass hardware. Triangular prong-set labradorite center. Crystal pav?? 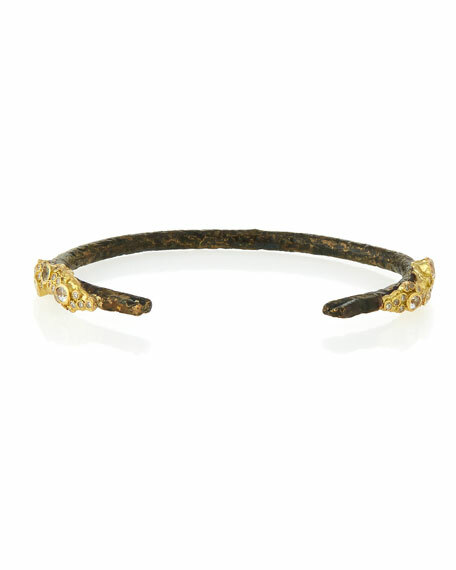 Alexis Bittar crystal encrusted freeform Roxbury cuff. Silvertone and 10-karat gold plated brass hardware. Triangular prong-set labradorite center. Crystal pav?? accents and wavy frame. Approx. 2.2" diameter; 2."H. Slip-on style. Imported.